Ministers volunteer to serve their parish and expect to be scheduled in a way that is compatible with their needs and desires. However, just producing a static schedule that is consistent with known constraints when it is produced is insufficient for real world scheduling where conflicts emerge over time. In addition to developing a schedule that meets the constraints of the scheduled ministers, MinisterScheduling.com offers scheduled ministers assistance in transferring assignments with which conflicts have developed after the schedule has been published. MinisterScheduling.com provides a means for ministers to express their scheduling constraints and preferences. Using the minister's console, every minister can block dates on their personal calendar to prohibit being scheduled on those dates. In addition, ministers can select up to three masses at which they prefer to be scheduled, limit the number of times per month that they are scheduled, and coordinate their scheduling with that of other parish ministers. Through the use of our proprietary multi-pass scheduling engine, your parish can produce a schedule that reflects all of the preferences and constraints that ministers have entered. If a conflict develops after the schedule is produced, a minister can use the minister's console to request assistance from other parish ministers in filling the conflicting assignment. A minister who is available to take the assignment can easily do so using the features of this service. The sections below describe some key features available through the minister's console. Each liturgical minister receives a personal private account which can be accessed using a User ID and Password combination. This account delivers the features that enable the minister to specify exactly how he/she will be scheduled. In addition, the account offers an easy way for ministers to keep their contact information current. Context sensitive help messages guide ministers in entering information. To access the help messages a minister merely needs to place the cursor over the field label. Should a minister forget his/her login credentials, an "I Forget" button is available for assistance. Completing a form containing the minister's name and email address will result in an email with a link to a page used for restoring access to the account. 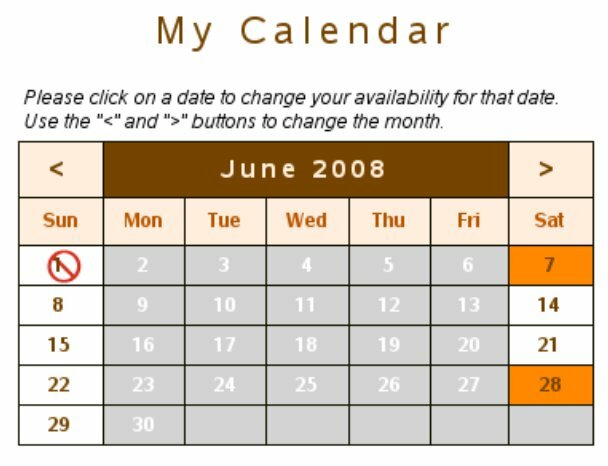 A minister can view his/her personal calendar to determine which days have scheduled masses (dates not shown in gray) and to block days that he/she cannot serve. When the schedule is prepared, blocked dates will not be scheduled for that minister. The calendar also shows dates on which the minister is scheduled to serve via a highlight for that date. The minister can check his/her assignments to see the specifics of the scheduled dates. The details of a ministers scheduled assignments can be viewed in the "My Assignments" section of the minister's console. Thus ministers can check their schedule anytime from anywhere they have access to a computer connected to the Internet. Up to a few days prior to the scheduled assignment, if a conflict develops, a minister can use the Find Sub button next to the assignment listing to get help from the service in transferring the assignment to another minister who is willing to assume it. The service will contact all eligible ministers and request their help in resolving the conflict. When another minister accepts the assignment, it is transferred to him/her and the originally scheduled minister is relieved of the commitment to serve. Ministers can select up to three masses at which they would like to serve. When the scheduling is done ministers are normally assigned to their first preference choice unless demand dictates that they are needed at their second or third preferences. Ministers who prefer to attend a specific mass can select only one preference to assure that they are not assigned to a different mass. The number of times that a minister will be scheduled each month can be limited using the "Assignments Per Month" control in the ministers account. Furthermore, a minister can limit the number of times per day that they will serve using the "Assignments Per Day" control. For scheduling, vigil masses are considered to be on the same day as the non-vigil masses for that day. The default values for these limits are set to one assignment per day and six assignments per month. Ministers can direct the scheduling to assure that their assignments are coordinated using the relationships settings. A minister can list other ministers with whom he/she wishes to be kept together. He/she can also list ministers who should not be scheduled with him/her at a mass. These settings will constrain the assignments for the ministers listed such that the settings are not violated. The "My Personal Information" section of a minister's console is used to keep the minister's contact information current. This information is used for ministry rosters and for communication with the minister. Ministers can also use this section of their accounts to change their login information. 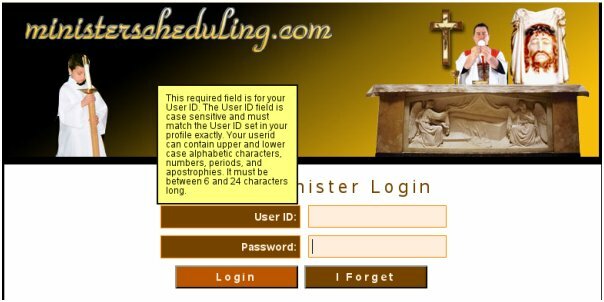 When a parish uses ministerscheduling.com to prepare its schedule, the ministers in that parish have confidence that the schedule will reflect their individual requirements and preferences. Ministers have direct control over their calendars, preferences and other scheduling parameters so that the schedules produced comply with these restrictions. Minister data, including scheduled assignments are available to ministers at any time from any place where the minister has access to a computer with an Internet connection. This data is available through the minister's personal account so that privacy is maintained.